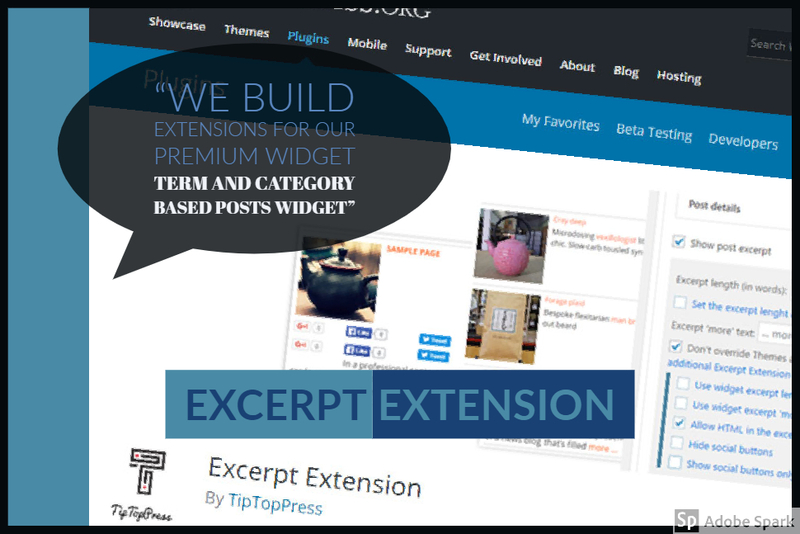 At the moment we plan three extensions and started with the first “Term Posts Excerpt Extension”. Why this as first? Here we get the most suggestions from our widget users. But first a short explanation. Primarily the excerpt sounds easy to use and good to configure. Unfortunately deceives that. If the post excerpt is configured, it is used in all placements with this preconfiguration. So the configuration should be nice. 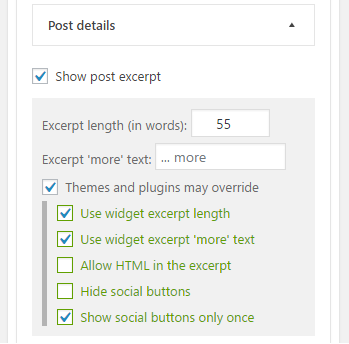 Here are the adjustments which WordPress let you do: Add the excerpt automatic-, manual and with the More tag (called teaser), include shortcodes, banner, social buttons, etc., include HTML elements, change the excerpt length in words and the more text. Depends where this configuration is done, for example in the Theme, in a Plugin, your Child Theme’s functions.php it’s nearly impossible to give stable widget options, which work for all WordPress installations. What is a “normal state”? And is the “normal state” differently on special use? The answer is yes, but special use is not for all users the same, because there are so many configurations. The answer is also, we’ll dig deep in custom code. If the user starts with a free or paid Theme, the Theme comes with set filters for the excerpt. Our thought is the Theme designer don’t know which widgets and plugins the user want to use and as we’ll say it: To which place you want to put your posts? As in the relation of using shortcodes, many placements are imaginable and possible. And so conflicts with the excerpt and between the Theme and installed plugins are not a rarity. Can be the programmer’s view the right one? In the second application case from the programmer’s view, the set excerpt filters must be overridden when using a recommended Child Theme. And we called this overriding code “custom code” and want get rid of it in our core widget code. Our solution is providing a excerpt extension.